As Squeaker and Muffin get older, one of the things I’ve been looking forward to is their becoming more rational beings. As I used to say to Nomi, babies are pure id; they want (and need) their desires to be fulfilled right away, whether it is for food or a clean diaper. And children in the toddler range have tantrums over the most ridiculous things. It’s why we have the phrase “the terrible twos” (and, as I discovered later on, “the terrible threes”). So when the girls turned four I was hoping that a“magic switch” would turn on and they would comport themselves much more rationally. Sadly, of course, I was being irrational about that myself. I don’t suddenly change my behavior when my birthday arrives, and I really shouldn’t have expected it from them. In my defense, I was mostly hoping. I was hoping the same thing when the girls turned five this past summer. Again, I should have been more prepared. It is true that slowly, over time, they do become more rational. In fact, I’ve been pleasantly surprised at how they whine and wail less often when they don’t get their way, and start accepting it more. But sometimes they do things that just make me shake my head in frustration. This week presented two examples. On Monday night, Nomi and I went to The Public Library of Brookline to hear a talk from Professor Carol Tilley in honor of Banned Books Week, and we left the girls with a babysitter, a young woman our family knows very well. The girls know her well too, as she has babysat them many times before. Well, for whatever reason, the girls went ballistic the moment she arrived. They screamed, wailed, cried and whined themselves into coughing fits and hoarse throats. They pulled at Nomi and me and wouldn’t let us leave. In the end, we managed to extricate ourselves, and from what we were told they were quiet within minutes. But of course, we didn’t get to see that. The other example came from yesterday, courtesy of Squeaker. Nomi and I picked them up at school and began the walk home, which should have taken us twenty minutes, tops. Muffin pretty much walked home with Nomi directly, although she did whine once when she thought Squeaker and I were getting ahead of her. But there was no danger of that, because Squeaker insisted she and I had to go to the supermarket to buy a watermelon. She made me walk with her to the door of the supermarket and then told me her plan. I tried to get her to go home by walking away, and she followed me, shouting and wailing. Eventually, we stopped on a corner and she calmed down, and I thought she was ready to go home. But no, I could not persuade her even to let us go home first and then go back out. 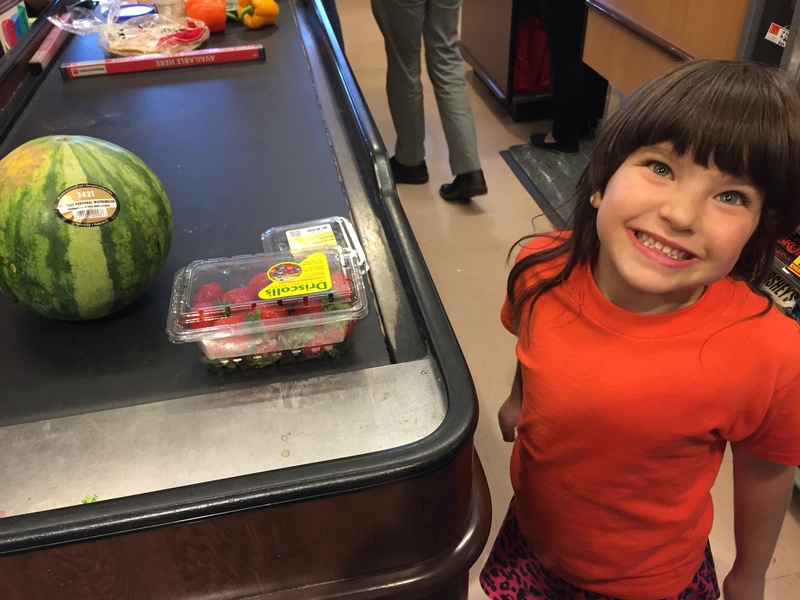 So, after calling Nomi to come out and get my heavy bag, Squeaker led me back to the supermarket where she insisted on riding in the cart with the “police car” in front and picked out a watermelon, strawberries, and blueberries to bring home. I guess I know what fruit Nomi and I will be serving for the Jewish New Year. This entry was posted in Columns and tagged irrationality, tantrums. Bookmark the permalink.